← Should I Spend Donuts on Jockey Bart and Furious D? This Event is broken up into 3 Acts (again, should be called Periods EA…), with each Act containing part of the story. To help you move along with the event you’ll get several prizes per Act. Each prize will either be something fun for Springfield or something to help you move along in the event. For the Second Act you’re tasked with collecting Hats ( ) to unlock each prize! The First Act 2 prize awarded at 5,800 is Alley McBalls, a new bowling supply store for your Springfield! So let’s take a closer look at this bowling storeand just what happens when you unlock it in your Springfield. 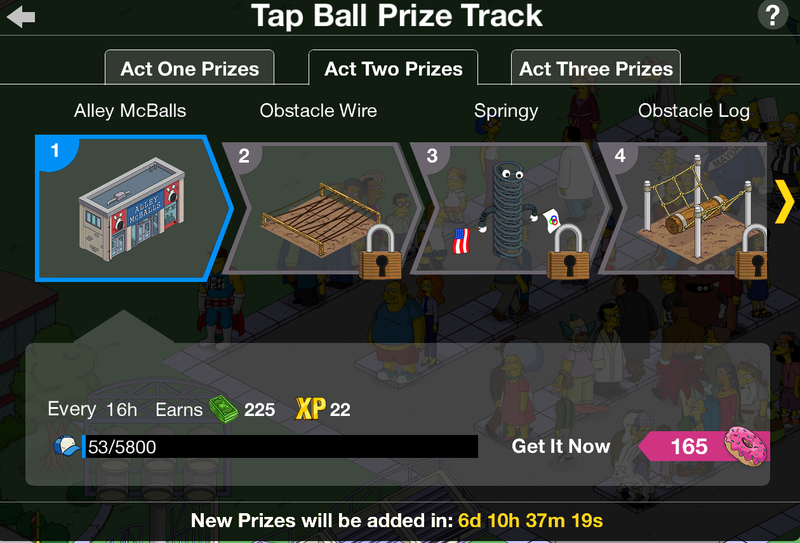 You’ll have the ability to place Alley McBalls in your Springfield immediately or place it in your inventory for later (store). If you store it, remember you’ll have to go into your inventory to retrieve it. Moe: Hey, look! There’s a new store in town. And it sells…bowling supplies. Because there’s a lot of bowling-supplies-only stores in the real world, right? Are we completely abandoning the idea that Springfield is IN ANY WAY based on real life? Is that what we’re doing? Homer: Well, Alley McBalls’ name IS a lame pun on a briefly-popular, late-1990s TV dramedy. That’s pretty realistic, right? Moe: I give up. Just tell us what mission we’re supposed to do at “Alley McBalls,” and we’ll do it. Unless, of course, we pass out from laughing at that HILARIOUS NAME. Moe: No, I’m sick of caring! Let’s just do this! Then afterwards, maybe I’ll head over to “Boston Eagle” to buy some eagle food to feed my pet eagle. That’s all they sell there. It’s also very realistic. THEN…it’s over to “Touch by an Angel Food Cake.” Guess what they sell? Moe: ANGEL FOOD CAKE MIX AND NOTHING ELSE!!!!!!!!!!! Pro-Tip: Yes, you can send Homer, Apu and Flanders on this task…but don’t. It earns at the same rate as their other Amateur Buck tasks, you’re better off sending them on those. Additionally, you can make some extra Amateur Bucks by sending some characters twice (9 of them). Here’s what you do…start the task by only sending 9 character on the task. This way when they’re done the task won’t be completed. After some time has passed, or the initial 9 have completed their task, send the remaining characters on the task. Then once the initial 9 have completed it, you can send them on it again. It’s a great way to earn an extra 144 Amateur Bucks. And YES, this works. I did it in my town and earned Amateur bucks from everyone doing this task, including the extra 144. What Does it Do? : Another building for your Springfield. Aside from the initial set of tasks there, it will not earn Amateur Bucks. But the nice thing is it does boost Consumerism…which is one of the hardest areas to max out! Apu will have a Permanent task there (For cash) to admire Luxury Bowling Balls. So that’s it my friends the full breakdown on Alley McBalls! What do you think of Alley McBalls? Where about you placed it in your Springfield? Thoughts about the event overall? Any prizes you’re most looking forward to? Sound off in the comments below, you know we love hearing from you! This entry was posted in Decorations, Tapped Out, Tips and Tricks, Updates and tagged Act 2 Prizes, Alley McBalls and the conform-o-meter, Hat Prizes, How big is Alley McBalls, How do I get Alley McBalls, Tap Ball Event, Tapped Out Tips and Tricks, The Simpsons Tapped Out, TSTO Addicts, TSTO June 2015 Event, TSTO Soccer Event, TSTO Tap Ball 2015, TSTO Tips and Tricks, What does Alley McBalls Do. Bookmark the permalink. Just earned 30,000 hats this morning and unlocked Marge, however she is not showing up as tap ball player or even a skin for Marge. I know you have posted links to contact EA in the past, but can you please post the link again? Just need about 2,000 more hats to get Tennis Marge….probably get her in the afternoon today. Bring on overtime donuts and act 3!!! Yes, you’re right look at luxury balls. Great pro-tip! Just wish it was published much earlier. I completed the 1st prize of the act, and figure most other people have as well, several days ago after act 2 started on July 3rd. This is a little delayed, no? Is anyone else being bombarded by game pushes to get you to play? Five minutes after playing I get a voice announcement saying I haven’t played for a while. Then again like every hour later. It’s super lame. I keep hoping that one of these mini-updates will fix it. Noticed something weird with Nelson. Sent him on the 8 hour task at the library (or was it the school) anyway, it was to earn tickets, and he earned money/exp instead. What was the task? Was it Football Nelson or Nelson? was Football Nelson for sure since I leave him in that costume during the event, I got him on the same task now, called Practice Tackling in the Hallway, supposed to give 8 tickets and 105 exp. Incidentally I just hit the max levels in game (so far) and got my bonuts, but missed the 3 donuts on the first two tries, so got 1, 2 and 3, yet it only counted 3 of them… I’m jinxed.